One of the hallmark symptoms of ADHD in both adults and children is impulsivity. Acting and speaking impulsively can cause some problems in your life. The older you get, the more the world expects you to self-regulate. In the book, Taking Charge of Adult ADHD, Dr. Russell Barkley describes ADHD as a 3-pronged problem including poor inhibition, poor self-control, and poor executive functioning. Poor self-control is described as, “focused on immediate rewards, unable to consider the consequences to their actions, likely to skip out on something they find boring, and problems listening to and following directions. This is at the heart of why we struggle with ADHD. 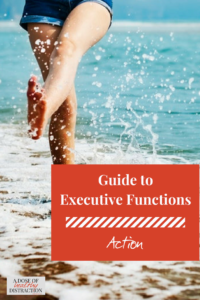 Understanding executive functions is vitally important to living our best lives with ADHD. “Many persons with ADHD, even those without problems of hyperactive behavior, report chronic problems in regulating their actions. They often are too impulsive in what they say or do, and in the way they think, jumping too quickly to inaccurate conclusions. Persons with ADHD also report problems in monitoring the context in which they are interacting. They fail to notice when other people are puzzled, or hurt or annoyed by what they have just said or done and thus fail to modify their behavior in response to specific circumstances. Often they also report chronic difficulty in regulating the pace of their actions, in slowing self and/or speeding up as needed for specific tasks.” As a person who has never had the hyperactivity that so many associate with ADHD, it’s good to know that somebody (the good doctors) understand that this diagnosis is not the same for everyone. In Coaching Corner we often talk about self-regulation. In fact, we talk quite a bit about Dr. Brown and Dr. Barkley in particular and how their models for ADHD relate to our lives. Many of us lack the ability to stop and think before taking action or responding emotionally. As we know this leads to words and behaviors we often regret. For example, if we sense that someone is judging us we might make a snap decision that they don’t like us and we are going to be rude right back. Stopping to ask ourselves if we are misinterpreting the situation would be a better choice but it rarely happens. Following directions, even our own, is nearly impossible. We miss the details and we find it boring so our minds move on to the next thing. Ever tried waiting in line at the grocery store behind an extreme couponer? I have. It didn’t go well. – Educate yourself on executive functions. – Practice calming techniques and personal mantras. – Think before you speak. Create a space between when someone else speaks, and when you speak. – Use timers on our phone, your computer, everywhere you can. Executive Functions touch every aspect of our lives. Understanding what EF’s are is of profound importance when you are trying to live your best life with ADHD. Assuming you have already been diagnosed, it is time to move forward and empower yourself with information. Work on yourself and all parts of your life will improve. Your relationships, your parenting and your self-perception will change. Over time you will feel more in-control of yourself and better able to express what you need and what makes you happy in a productive way. You won’t be constantly apologizing for your behavior and actions. Join our growing community of women and mothers with ADHD and get 5 days of videos straight from me.